Maureen Morgan, pupil at Broadwell Lane End school enjoyed leafing through a scrapbook put together by children when Laurie Howarth who was head at BLE from 1963 and then continued as head at Coalway Juniors retired. This has been loaned by his son to whom we send thanks. These memories and stories are making our community history a rich journey, but it is a jigsaw and your own story will always add another piece. 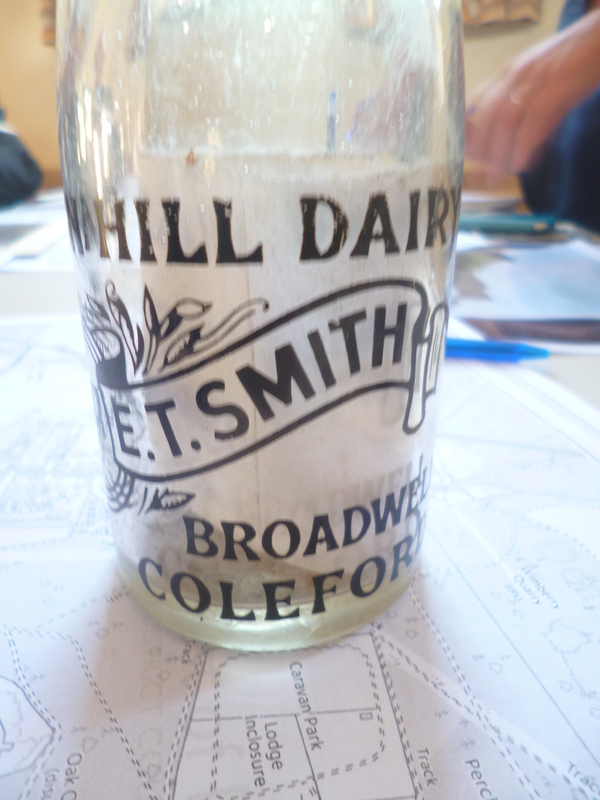 The milk bottle you see above is a wonderful object and we will be examining, exploring, maybe drawing and sharing stories about objects, this bought,sold,created this sunday with artist Diana Gash. Bring objects, stories, photographs and thoughts and see how our incomplete History of Broadwell exhibition is beginning to grow. Session begins from 11am Diana will join us from noon, Next week, sunday 19th, Nicola Goff shares her memories of growing up beside Jugs Hole (any clues to who named it?) and on sunday 26th Author Andrew Taylor will explore writing about a sense of place as we move toward Broadwell Diary day on friday 1st July. This project is part of Coleford Festival of Words 2016 and is supported by Foresters Forest and the Evergreen Action Group.